In 1981 a tornado lifted a sleeping baby from its pram and set it down again unharmed. A thirsty camel can gulp down 103 litres of water in 10 minutes. If you could trap all the energy in a hurricane and convert it into electricity you'd have enough to supply the United States for three years. Some sightings of the Loch Ness monster are probably water devils. These are just a few of the weird facts from my latest weather book. It's not only weird facts, though. 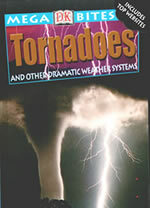 I also explain what causes different types of weather and what effects the weather can have. And all for under £5!